In last week’s post, we discussed how to give your blog a boost. 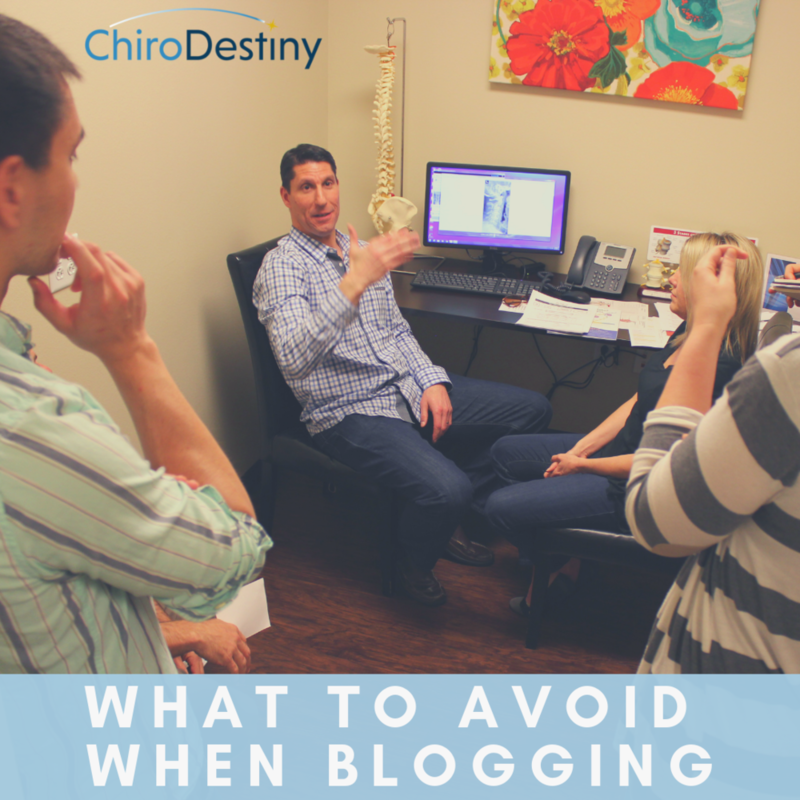 Now that you’e got the basics down of how to start your own chiropractic blog, let’s cover what you want to avoid. What you offer as a chiropractor is unique, and so is how you operate your practice. So shouldn’t your blog posts be unique, too? You may spend some time reviewing other chiropractic blogs to give you an idea of what to write about, but that doesn’t mean copying the article in its entirety. Not only is plagiarism not the best habit to get into, but your blog posts won’t stand out from the rest. Set aside time to take and incorporate pictures of you and your team members. Make unique posts on a variety of platforms (Instagram stories, anyone?). It might not be the easy path, but it’s the right one and will further engage your audience. Everyone makes mistakes, especially when you’ve been typing away on the keyboard. If you happen to have a mistake or two in a blog post, no big deal. But when your entire article is full or spelling, grammatical, and formatting issues? That’s a different story, and one that doesn’t reflect well upon your practice. Double check your article before posting or have a fresh set of eyes take a look at it for any errors. Picture this: a potential patient suffers from neck pain. They get online, search “neck pain relief”, and come across a blog post you wrote that describes how chiropractic care is an excellent treatment for neck pain. Sounds great, right? Well, at the end of the article, you skipped the call to action. You didn’t leave an appointment link, or invite the reader to call your practice. So the potential patient then searches “chiropractor near me” and guess who comes up? Your competitor! Now your potential patient has become someone else’s. Sure, you put in the time to educate them with your blog post, but someone else will be enjoying the benefits. Sure, the person might search to find your office, but they might not. Avoid the risk altogether and include a call to action in your blogs. By following our tips, your blog will be off to a great start. Think blogging isn’t for you? Contact us for a free coaching call, and we can help connect you with the right resources to help you find success.